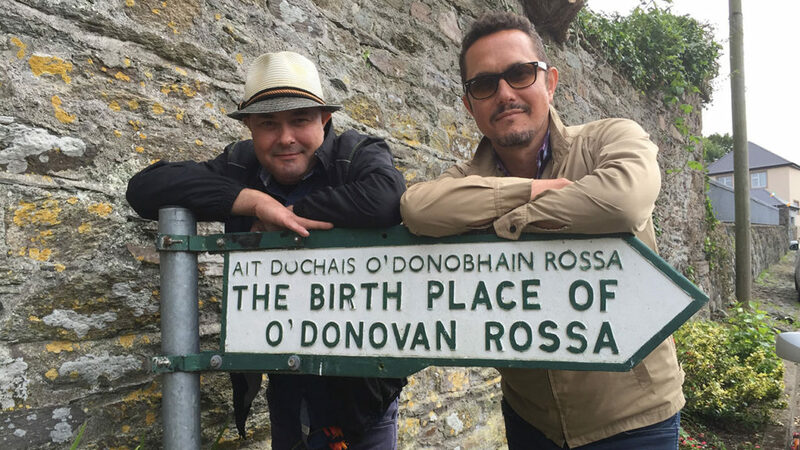 “Rebel Rossa” is a personal investigation into the life and legacy of the Irish rebel Jeremiah O’Donovan Rossa by his American great-grandsons who traveled to Ireland to trace their family history and uncover all there is to know about Rossa and his wife Mary Jane. Brothers Rossa Williams Cole, left, and film director Williams Rossa Cole. Photo courtesy of Rossa Film Inc.
Ireland’s Great Hunger Museum at Quinnipiac University will screen the documentary, “Rebel Rossa,” on Thursday, May 18, at 6 p.m. in the Center for Medicine, Nursing and Health Sciences at Quinnipiac University, 370 Bassett Road. Tickets are available for $10 each and should be purchased in advance at www.ighm.org. The 88-minute film covers Rossa’s life starting with his childhood in rural Ireland, his experiences living through the Great Hunger, the time he spent in six different Victorian jails, his exile to the United States and the origin of his nickname “O’Dynamite Rossa.” The documentary tells the story of how Rossa’s life as a member of the Irish Republican Brotherhood and his resistance of the British government ultimately led to the 1916 Easter Rising. After the screening, Williams Rossa Cole, who served as a producer, director and editor of the documentary, will lead a discussion on the contemporary effects of his Fenian great-grandfather’s life. You can watch the documentary’s trailer here. Ireland’s Great Hunger Museum at Quinnipiac University is home to the world’s largest collection of visual art, artifacts and printed materials relating to the Irish Famine. The museum preserves, builds and presents its art collection to stimulate reflection, inspire imagination and advance awareness of Ireland’s Great Hunger and its long aftermath on both sides of the Atlantic. The collection focuses on the famine years from 1845-52, when blight destroyed virtually all of Ireland’s potato crops for consecutive years. The crop destruction, coupled with British governmental indifference to the plight of the Irish, who at the time were part of the United Kingdom, resulted in the deaths of more than 1 million Irish men, women and children and the emigration of more than 2 million to nations around the world. This tragedy occurred even though exports of food and livestock from Ireland continued and, in some cases, actually increased during the years of the Great Hunger. The museum is open Wednesdays, Fridays and Saturdays, 10 a.m. to 5 p.m.; Thursdays, 10 a.m. to 7 p.m.; and Sundays, 1-5 p.m.